New Hampshire had a very short lived gold rush in the 1860’s when gold was first discovered in small quantities. A few small mines operated in the Bath, N.H. area for several years, but most mining activity was short lived since the small quantities of gold discovered were not profitable for large scale operations. 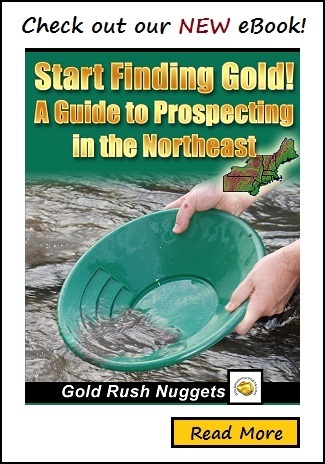 Although the amount of gold in New Hampshire has not been enough to attract much attention from mining companies, individual prospectors can find many areas to look for gold. Placer gold is widespread throughout several streams and rivers in the state, and panning can be productive for those who find a good area to look. Most gold found in New Hampshire is in the form of very small dust and flakes, although small nuggets have been reported. Below are a few areas that gold has been discovered. There is likely to be other small creeks near the areas listed below that will also produce some placer gold for the hard working miner. Much of the gold bearing areas in New Hampshire are on private land, so be certain to obtain the proper permission before you begin and prospecting. The minerals legally belong to the landowner, so permission is not only a common courtesy, but the law as well. Also be aware that the regulations in New Hampshire are quite restrictive, not allowing shovels to be used to dig gravels in a stream bed. Using a gold pan to scoop up gravels is allowed. In addition, using larger equipment like suction dredges and sluice boxes requires a permit from the state, and may not be allowed in certain areas or during certain times of the year. If you decide that you want to use larger mining equipment, contact the New Hampshire Department of Environmental Services Wetlands Bureau for additional information.